This unusually modelled private house in 'Swiss chalet' style is half villa, half townhouse. 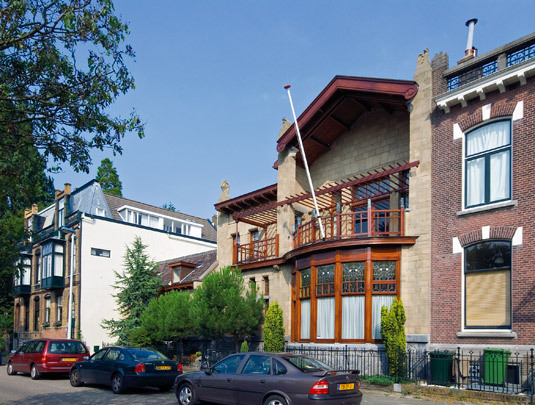 Its design earned its architect, Jacobus Pieter Stok, a silver medal in a facade competition held in 1904. It was built for Justus Schreuder, the director of a seed company. Schreuder was best known as a music lover, hence the music room included in the house's design. The tuff stone exterior has a Belgian blue stone basis and memorable wood features including a semicircular bay window and balconies. The wood veranda has railings decorated with carved owls.